In 1948, KAISER-FRAZER achieved ninth place in the American motor industry with record sales. But the following year, they dropped to fourteenth place and it was obvious that something had to be done - and done quickly. Company President Joseph Frazer knew that the big three automobile producers would have new designs for 1949, whereas KAISER-FRAZER cars would only be having a facelift and he recommended that there should be a cut-back in production until the 'way-ahead' could be correctly determined. Henry Kaiser rejected this idea and borrowed 44 million dollars from the Reconstruction Finance Corporation in order to tool-up for new models that would include a compact car for the American market. Frazer immediately resigned as President and took a lower position on the board. This gave Kaiser the chance to create a small car in his name only - the Henry J. Designer Howard 'Dutch' Darrin suggested a short (100 inch) wheelbase compact with features linked to the new Kaiser design for 1951 that had already been approved. But Kaiser wanted an all-new car and settled on a design by American Metal Products. Reluctantly, Darrin tried to improve the styling and as a result, the car was awarded 'Fashion Car Of The Year' by the New York Fashion Academy. Two engines were available; a 2.2 litre 4 cylinder 'Supersonic' engine, as fitted to the Willys Jeep and a 3.6 litre 6 cylinder 'Supersonic' engine that gave a speed of 0-60mph in 14 seconds. 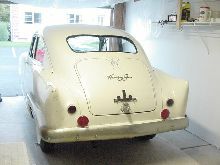 Kaiser started production of the 1951 models in March 1950, but the austere 1951 range lacked glove boxes and bootlids, items regarded as essential to many prospective buyers. 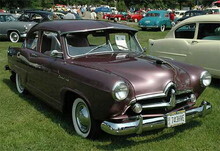 Nevertheless, a record number of Henry J's were sold in 1951. But this saturated the market and sales plummetted through 1952/53. The falling sales of Henry J's by Mail Order giant Sears Roebuck, who had re-badged a revamped version they called the Allstate, meant that future orders would be cancelled from that direction too. The 1952-54 models had a minor facelift and an interim model for early 1954 used up re-serialised Vagabonds from 1953 and had 'Continental' rear mounted spare wheels fitted. But despite the fact that the Henry J was assembled at plants in Mexico, Japan and Israel and had been the chosen chassis for both the Kaiser Darrin DFK-161 and Brooke Stevens' experimental Excaliber J sports cars, it was obvious that the Henry J had failed. It was an ill-timed concept at a time when Americans were looking for luxury and comfort in their automobiles. Kaiser merged with the Willys-Overland Corporation in Toledo, Ohio in 1954 to form Kaiser-Willys and the Willow Run plant was sold to General Motors. The Henry J was later dropped in favour of the Willys 'Aero' range, but even those were finished by 1958.